VietPress USA (Aug. 2nd, 2018): Today the first time, President Trump strongly attacks Press & Media as "Fake, Fake disgusting news" when he speaks at his campaign rally in Pennsylvania on Thusday, August 2nd, 2018. President Donald Trump unleashed a torrent of grievances Thursday at a Pennsylvania campaign rally in which he cast journalists as his true political opponent. "What ever happened to the free press? What ever happened to honest reporting?" Trump asked, pointing to the media in the back of the room. "They don't report it. They only make up stories." He tore into the media for diminishing what he accomplished at his Singapore summit with North Korea leader Kim Jong Un. He complained about the tough questioning he received in Helsinki when he met with Russia's Vladimir Putin last month. 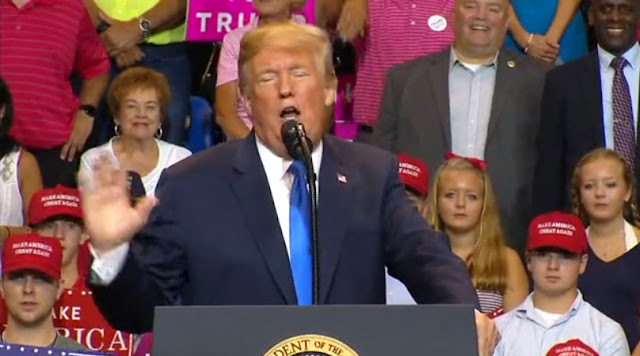 And he began his rally speech with a 10-minute remembrance of his 2016 election night victory, bemoaning that Pennsylvania wasn't the state to clinch the White House for him only because "the fake news refused to call it." WILKES-BARRE, Pa. (AP) — Thundering that the media is the "fake, fake disgusting news," President Donald Trump unleashed a torrent of grievances Thursday at a Pennsylvania campaign rally in which he cast journalists as his true political opponent. Trump barnstormed in a state that he swiped from the Democrats in 2016 and that is home to a Senate seat he is trying to place in the Republicans' column this fall. But the race between GOP U.S. Rep. Lou Barletta and two-term incumbent Democratic Sen. Bob Casey took a back seat to Trump's invectives against the media, which came amid a backdrop of antagonism to journalists from the White House and hostility from the thousands packed into a loud, overheated Wilkes-Barre arena. "They were suffering that night, they were suffering," Trump said of the election-night pundits. He then promised that the Keystone State would deliver his margin of victory "next time." "Only negative stories from the fakers back there," the president declared. The inflammatory performance came just hours after White House press secretary Sarah Huckabee Sanders refused to distance herself from Trump's previous assertions that the media is the "enemy" of the American people. Pressed during a White House briefing on the issue, Sanders said Trump "has made his position known." "As far as I know, I'm the first press secretary in the history of the United States that's required Secret Service protection," she said, accusing the media of continuing "to ratchet up the verbal assault against the president and everyone in this administration." Although Barletta's bid was an undercard to Trump's main event, savaging his opponents, the president did bless the congressman's bid. Trump, who has accelerated his campaign schedule in recent weeks to help the Republicans he favors both in primaries and November's midterms, was the first Republican to win Pennsylvania since 1988. "For years and years, they said Republicans should win the state of Pennsylvania," Trump said. "It always got away. But we won the state of Pennsylvania." He and Barletta, who is trailing by double digits in the polls, share hard-line immigration views, and Trump lashed Casey with his own derogatory nickname: "Sleeping Bob." But Trump's focus was on defending his own accomplishments and beliefs. He pushed for tougher borders, overstating the threat posed by violent gangs like MS-13 and making the group a stand-in for all immigrants in the United States illegally. He defended his kid-glove approach to both Kim and Putin, saying, "it would be a good thing, not a bad thing" to have warmer relations with the hostile powers and dismissing talk that summits with the autocrats elevated them on the world stage. He bashed the Democratic leadership of Senate Minority Leader Charles Schumer and House Minority Leader Nancy Pelosi and, curiously, suggested that his frequent foe Rep. Maxine Waters of California was "a new star" of the party. And he looked ahead to his 2020 re-election campaign, touting his new slogan, "Keep America Great Again" while musing whether he wanted Massachusetts Sen. Elizabeth Warren, whom he decried as "Pocahontas," or Vermont Sen. Bernie Sanders, whom he flatly deemed "crazy," as his opponent. The rally came at a perilous time for Trump, who, the day before, had bluntly declared via tweet that his attorney general should terminate the federal probe into the campaign that took him to the White House. It was a newly fervent attack on the special counsel investigation that could imperil his presidency. Sanders scrambled to explain that Trump's tweet was "not an order" and that the president was not directing his attorney general to do anything. Negotiations have also started again about a possible presidential interview as Mueller's team has offered the White House format changes, perhaps willing to limit some questions asked of Trump or accept some answers in writing, according to a person briefed on the proposal who wasn't authorized to discuss private talks and spoke on condition of anonymity.